Big A little a: Happy Birthday! Happy Birthday to my eldest child. She turns 10 (!) today. In honor of her birthday, I thought I'd share our favorite birthday book. She's long outgrown the book, but both she and her younger brother loved it, so it has been read continually for ten years. 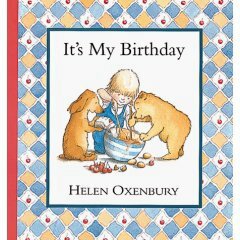 It is Helen Oxenbury's It's My Birthday. What I love about It's My Birthday is its beautiful simplicity and charming drawings. No consumerism here. It is a young child's birthday and he (or she) wants to make a cake. All his (or her) animal friends help to obtain sugar, milk, butter, salt, flour, and, best of all, cherries for the top. Not expecting anything in return, the animal friends are all thrilled to celebrate with the young child in an impromtu party when the cake has cooled.